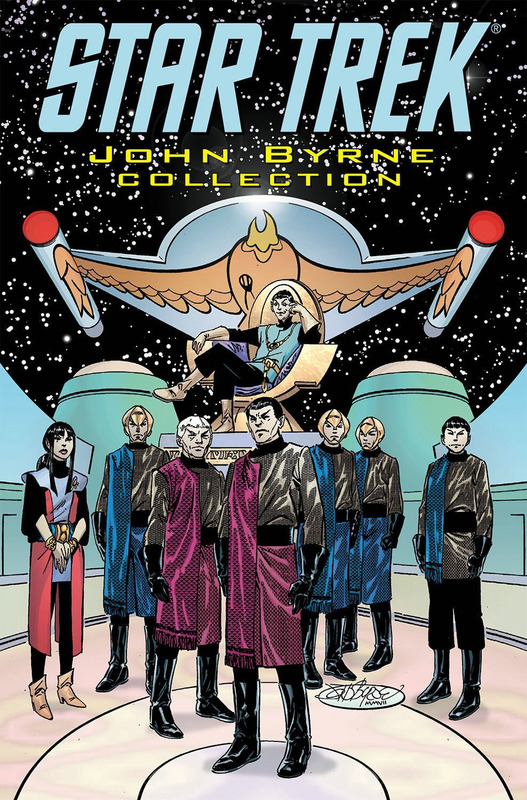 Comics legend John Byrne has taken on 4 Star Trek titles, and they are all collected here, in one oversized hardcover collection. "Assignment Earth" recounts the adventures of interstellar agent Gary Seven, "Crew" recounts a tale from the very beginnings of the United Federation of Planets, "Leonard McCoy: Frontier Doctor" is a collection of tales from the member of the Frontier Medics Program, and mystery, intrigue, and war abound in "Romulans." This will be a "last chance" to clean up all the little glitches that have persisted thru various iterations, like the Engineer whose name changes mysteriously in SCHISM, and may failure to identify the Organian who pops up at the end of the same series. Also correcting a line of dialog from TOS which was "fixed" by an over-zealous proofreader in THE HOLLOW CROWN. We're also going to see if it's possible to fix the poor resolution on the first issue of A:E, which was my fault since I somehow scanned the pages at the wrong setting. Sounds good. But I really want to know is, when will Byrne be giving us some new Trek? !